At first glance they look EXACTLY THE SAME. It doesn’t seem like anything was changed. Clicking the … takes you into the regular Expression Editor which allows you to use any of the normal Operators and Functions. This is a big deal! Frankly, I was shocked when I first used the Report Designer and discovered that you couldn’t group on a calculated field. It’s great to see that this feature has been introduced in 5.0. This is a great illustration of what you get with an up-and-coming ERP product like Acumatica because it is a product that is constantly improving and constantly adding new functionality. The future is bright. The second thing that I noticed is a new function in the function list. There are 90 Operators/Functions in 4.2, but there are 91 in 5.0!! That’s a whole 1 more than we had before. Not that exciting I know, but at least we’re headed in the right direction. At least there aren’t 89 Operators/Functions in 5.0. The new function is called Substring and it allows you to grab a fixed length of a string, starting at a specific character in the string. 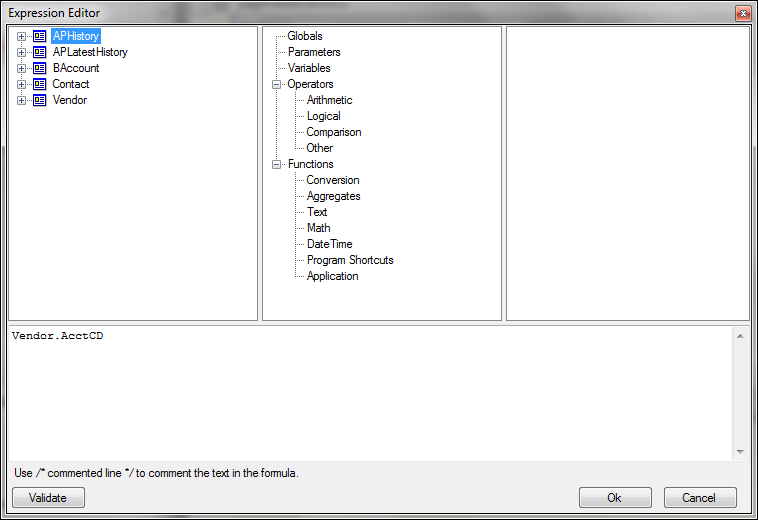 It’s nice to see a new function introduced in Acumatica 5.0. I have an idea for a function that I think would be useful. If you click this link, you can vote on it and maybe we can get it added to the next version of Acumatica. This isn’t actually a new feature, but I thought it was interesting to include. I did a quick test and opened a 4.2 report in the 5.0 Report Designer program, made a small change, then saved the report. I then compared the report files using a program called WinMerge and discovered that they are exactly the same except for the small change that I made. The point is that you can still use the 5.0 Report Designer program even on a 4.2 Acumatica application. Of course, you can’t use feature #1 (calculated field grouping) mentioned here because it doesn’t exist yet in the 4.2 application. 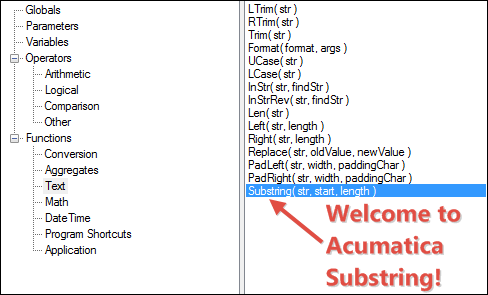 However, you CAN use feature #2 (Substring function). I’m not sure why because it isn’t listed in the 4.2 Report Designer, but I did a test and it seems to work fine on my 4.2 Acumatica application. It makes me wonder how many other functions are out there but hidden. 4. Alt-Tab now works correctly! This feature is like the UNDO feature below in that it’s not a big feature, but it sure makes using the Report Designer a lot easier. It used to be that you couldn’t Alt-Tab back to Report Designer if a window (like Expression Editor or Open report from server) was open. But this has been fixed and I’m very happy! I can’t tell you how many times I need to Alt-Tab back into Report Designer when a window in Report Designer is open. And now I can in Acumatica 5.0. This one also isn’t a new feature, but I couldn’t help but include it here. The Acumatica Report Designer still doesn’t have an UNDO button. This is a real pain, especially when you accidentally move a whole group of fields at once. 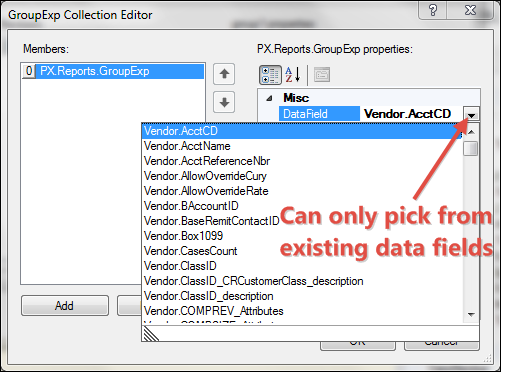 You can cast your vote here to get this feature included in the next version of Acumatica. 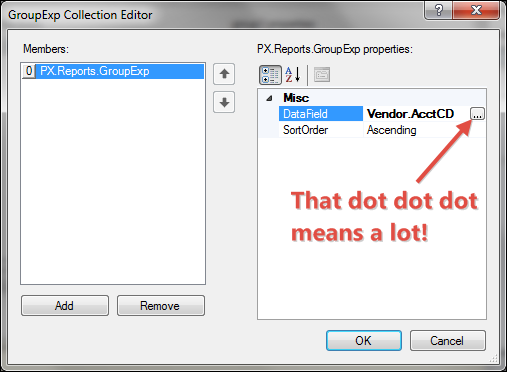 Please let me know in the comments if you know of any other new Report Designer features in 5.0.